Problem gambling is a mental health issue that touches Floridians of all ages, ethnicities, and creeds. It is often referred to as the hidden illness. Unlike drugs and alcohol, people can’t overdose on gambling, but that doesn’t mean it is any less devastating. The Florida Council on Compulsive Gambling operates a 24/7 Helpline designed to furnish support and resources to those negatively affected by problem gambling. Our helpline specialists constantly hear stories about overwhelming debt, crushing depression & anxiety, familial conflict, and a plethora of other issues that plague gamblers and their loved ones. To get a better picture of the statistics that surround problem gambling, Click Here. Aside from operating a 24/7 helpline, the Florida Council on Compulsive Gambling offers trainings to the public. Our CME training is jointly offered by USF Health. It is a one hour training designed to give medical students and other students in HealthCare fields experience and exposure to problem gambling. Everyday compulsive gamblers and those they adversely affect present in doctors offices, emergency rooms and elsewhere with symptoms never attributed to gambling. Despite research associating pathological gambling with alcoholism and substance abuse, rarely is the association between poor health and pathological gambling made. Chronic stress, a sedentary lifestyle and heavy exposure to secondhand smoke are also contributing factors to illness within the pathological gambling population. 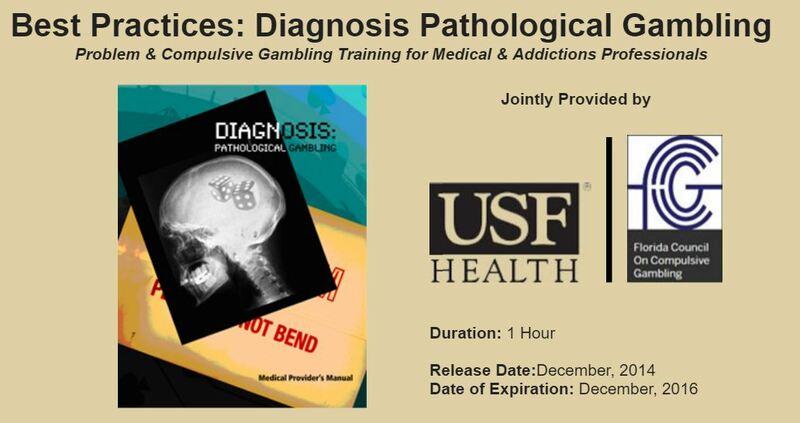 This program features important information designed for medical and other students in healthcare fields to recognize and effectively treat patients with pathological gambling disorder. Describe ways problem gambling presents as a public health issue. Describe appropriate ways to treat those seeking help with problem gambling. Assess way patients present in doctors’ offices, emergency rooms, urgent care centers, and elsewhere with symptoms association with Gambling Disorder. Integrate appropriate screening and treatment practices into current approach to enhance patients’ physical and emotional well being. Generate appropriate referral and medication prescription base on presenting conditions.